As we continue into this new century, we are realizing that things need to change to save our planet. There are small efforts by many people on a daily basis that accumulate into a big difference: recycling, reusing and converting metals and plastics, driving low emission cars, hundreds of other small efforts, and all of these efforts are for the future of our planet and the future of our children. With the world population reaching into the billions, the effects of human waste is the new ecological challenge. The United States uses over 6 trillion sheets of toilet paper, which equates to over 16 million trees used yearly for our daily bathroom use. We flush this paper down the toilet with an “out of sight, out of mind” mentality. Where does it all go? 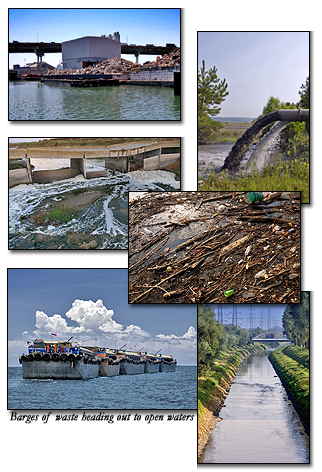 Most goes into rivers and waterways and onto barges for disposal into open ocean waters, so it is safe to say our oceans eventually bear the brunt of this waste. From science class, you know that the more that is added to water – in this case wood pulp – the lower the freezing point. All this toilet paper – and it will increase as the population grows – causes the warming of waters and contributes to the melting of the polar ice caps. This minute temperature change effects the ecosystem of our planet with droughts, flooding, high winds, and the hampering of its ability to clean our air. This worldwide pollution of our oceans plays a major role in the natural filtration cycle of this planet. Using the Original Bidet Bottle will help reduce the amount of toilet paper you use. Instead of using paper for cleaning, you now only use a few sheets to dry yourself. You will see immediate results with a huge reduction of paper usage – and purchase. Now you can achieve true cleanliness and know you are helping your environment every day..